Accessibility: It applies to me too?! I had the opportunity to attend and present at a great conference a few years ago at which Cindy Li delivered a phenomenal keynote. I learned about 8 million new things during her talk, but she made one particular statement that really stuck with me. She talked a little bit about her mother who has an ocular disease that is slowly blinding her over time. Then she mentioned that while she doesn’t have an ocular disease herself, she is beginning to require stronger glasses prescriptions each year. Why am I talking about Cindy’s eye health? Because she then pointed out that as designers we need to design for accessibility, not only for folks who are permanently visually or hearing impaired or have severe motor issues right now, but also for our future selves! Design for the future you. With each passing birthday, our vision is starting to go, eventually our hearing will start to go and so will our mobility. I will have these issues, you may have these issues, they’re just part of the aging process. We aren’t just designing accessible products and websites for a subgroup of people who we may or may not know, who have permanent visual or motor issues, we’re designing these sites and products for our future selves as well. 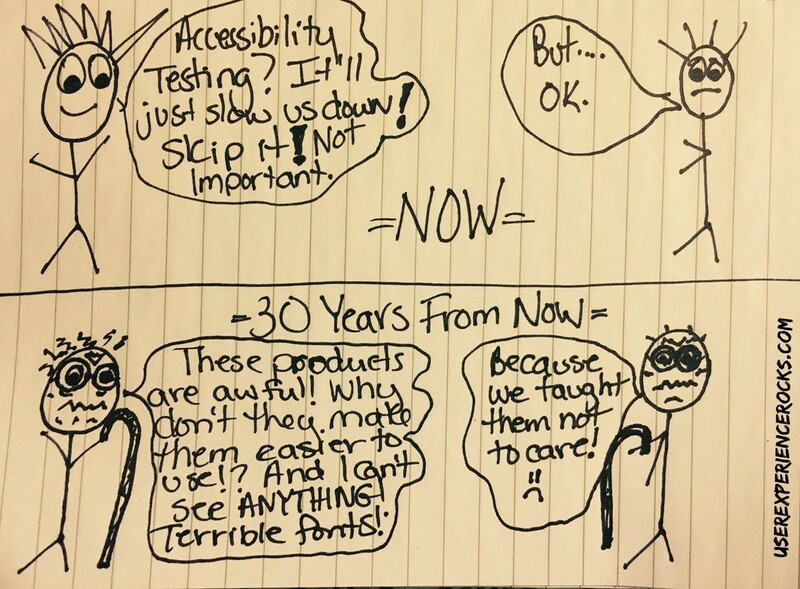 The next time you’re tempted to brush off accessibility while you’re working on a design, picture yourself in 20 or 30 years trying to use your own website or product. It’s a pretty life changing shift in thinking. I like to call it “forced empathy”. Angry, sobbing or drunk people may try to use your product or website—ready? The last day of the conference a second session was given with a focus on accessibility. This time the presenter, Robin Smail, pointed out that every visitor who comes to your site is NOT going to be dedicating 100% of their mental energy to navigating your product or website content. The point of her talk was that we need to focus on accessibility and awesome UX for ALL visitors, whether they have permanent issues, or temporary ones. If you run into a wall when trying to pitch accessibility testing and optimization to stakeholders, try putting the temporarily abled spin on it. It shouldn’t be necessary, since making websites and products accessible is exceptionally important, but sometimes forcing someone to envision the work helping them personally can really go a long way. Another great way to get them on board is to show them what it’s like to navigate their site or product with a screen reader. (Spoiler Alert: It may make them want to gouge their eardrums out with pencils.) Folks often don’t realize what they’re putting other people through by not making their sites and products accessible. A quick demo can be very eye opening. Share your accessibility testing knowledge with the community.